We sell only the best – true therapeutic quality essential oils, 100% pure and natural with nothing added or removed. Q: What’s the difference between Therapeutic Grade Essential Oils and Therapeutic Quality Essential Oils? The following Terms all mean the same thing. generic, food grade or pharmaceutical grade essential oils, all of which may have had components removed or added to “standardize” them and some consider them to be unsuitable for the aromatherapy industry. So, you, the consumer must simply decided which company/brand actually tells the truth about what they are selling. In addition to the few unethical companies that sell the cheapest of essential oils as being therapeutic, there is another camp of unethical companies that promote their essential oils as being the only therapeutic quality / therapeutic grade essential oils in the world. This is simply not true. All of our Artisan Aromatics brand Essential Oils are Therapeutic Quality and we hope that you will choose to use our essential oils. All Artisan Therapeutic Quality Essential Oils are fully guaranteed. If you don’t like it, contact us, let us know why and return the item. We’re a bit old fashioned in that we still believe that “The Customer is Always Right”. Since there is no official body or organization that grades essential oils. The “grades” (therapeutic grade, aromatherapy grade, 100% pure, therapeutic quality, aromatherapy quality, etc.) are subjective. We use these terms to let you, our customers, know that we have done rigorous research to find what we consider the best essential oils. We do not obtain just any essential oil to sell under the Artisan Aromatics brand. 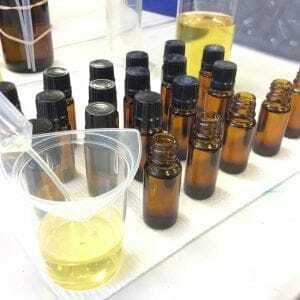 We vet the distiller or vendor and make sure that proper lab testing as well as our own “nose” testing is done on each oil before we add it to our line of essential oils. For more info on who we are / what we do, please check out our page: About Us. We bottle and label each oil only after we receive an order so your oils are as fresh as possible and have not been sitting on a dusty shelf for who knows how long.